The latest iPhone 2.2 firmware has one hidden feature that should please Japanese iPhone customers: the inclusion of 461 emoji characters. "The iPhone is a difficult phone to use for the Japanese market because there are so many features it doesn't have," says Eimei Yokota, an analyst with MM Research. He said one small but must-have feature that is often cited as a deficiency in the iPhone is the lack of "emoji," clip art that can be inserted in sentences to jazz up emails. 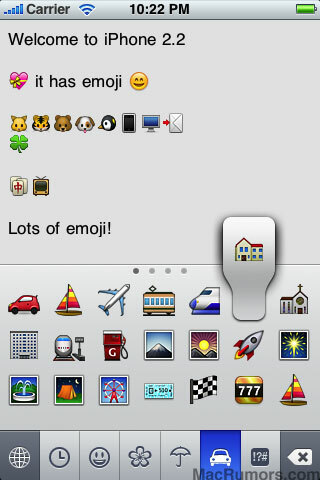 While the latest iPhone 2.2 firmware contains the emoticons, they are not user accessible at this time. The above screenshot was generated by calling the unpublished API. The images are located in a single artwork file in the UIKit.framework. The clock icon on the left gives you access to your recent emoji, while the other icons give you access to differently themed emoji.